I am a big fan of local co-op games. Not only does my girlfriend play a lot of games with me, but we usually have a group of friends over every weekend for game night where these kinds of games are the highlight. When I saw co-op parenting simulator, Think of the Children, I knew I had to try it out. As it turns out, parenting is a lot harder than I realized. Who knew kids could get into so much trouble? Does this unique twist on your typical party game offer a fun way to spice up your next game night? Let’s find out. 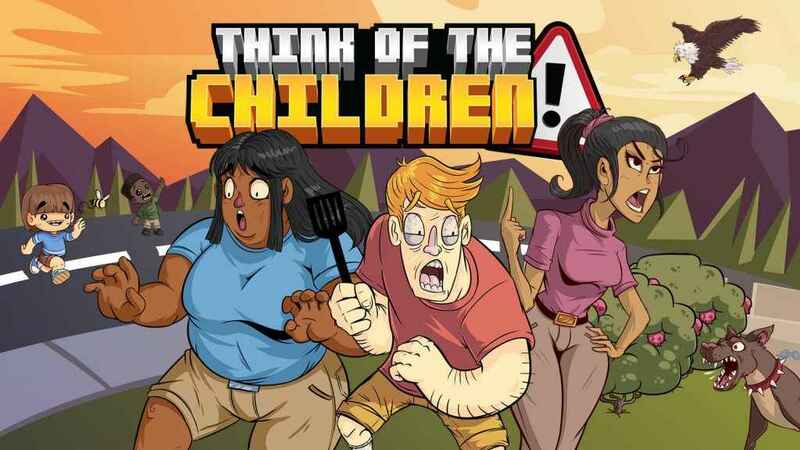 Think of the Children throws you into some pretty intense scenarios from the get-go. The first level, for example, places you in a wholesome picnic setting. You need to tend to the grill, set up the tables, and make sure the kids aren’t getting into anything. Seems pretty simple, right? Well, as you progress through the levels you’ll quickly find that your kids have a talent for getting into just about everything. Whether it’s swimming in shark infested waters, playing with knives, or trapping themselves in supermarket freezers, there are plenty of hilarious and macabre ways for you to lose the little ones. The goal of the game is to keep as many kids alive as possible, but this isn't your only objective. You’ll also be rated on specific tasks in each level. This ranges from simple things like setting up tables, to making sure grandpa has enough sunscreen at the beach so he doesn’t burst into flames. A story mode ties all of this together through the framework of a court case where the parents are trying to defend themselves before a judge. This works really well as a tongue-in-cheek narrative, and the callbacks to events in each level are hilarious. Progressing and unlocking new levels requires you to achieve a certain letter grade, and in many cases this will require multiple attempts. The sheer level of chaos on display during each level is hard to describe. The game gives you warnings when something is about to go wrong, and you have a limited dash that you can use to clear distance quickly. For the children, you can either pick them up and pull them out of the situation, or you can yell at them to stop what they’re doing. Other things will require you to mash a button until you fill a meter to complete the objective. The surviving children at the end of the level will act as a score multiplier, while your performance in the objectives will add points to the final score. Snarky badges are awarded to each player as well based on elements of your performance. There’s a nice variety to the levels, and a good amount of them to go around as well. While I liked the levels with repeatable tasks and children to keep safe, there were other levels types that didn’t resonate as well with me. Some levels require you to complete a checklist while an embarrassment meter counts down for each thing your children do to make you look like a bad person. 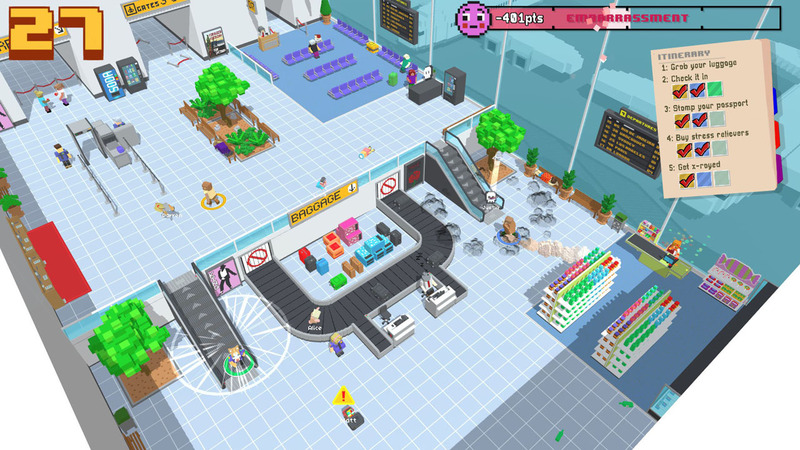 One example is a grocery store where you need to bring specific items to the counter, and other takes place in an airport where you need to go through several processes. These types of levels were less enjoyable for two reasons: they took the focus away from stopping the kids and offered vague objectives that weren’t fun to complete. Keeping a grill from bursting into flames is all well and good. Setting up ice cream to distract the kids? Awesome. Running around an airport trying to figure out how the game wants me to check in my luggage? Not so much. These levels offers a quickly flyby of the various objectives before throwing you into the chaos. It was here that the game became too complicated. The simplicity of managing several small tasks while managing the chaos of children was a perfect balance. Adding vague tasks to the list is a step too far into frustrating territory for me. Despite this, we still had a lot of fun gathering around the TV for game night and trying to not be terrible parents. Think of the Children has a simple aesthetic and an isometric camera that gives you a bird’s eye view of the action. The simple controls and smooth framerate make it easy for anyone to pick up and play. While it leans a little too much into the objective side of things in certain levels, the ability to customize your entire family and play through the hilarious story mode makes this a solid contender for your next game night. Hopefully you end up being a better parent than I was. If nothing else, this game has prepared me for anything.